Programs and events don't always turn out like we plan. Sometimes we misjudge interest, and sometimes we misjudge the timing or venue. In other cases, the program is well done, but we don't meet our goals because we didn't set the right target to begin with. We're managing close to 30 client fitness programs in senior living communities, so we're bound to miss the mark on a program here and there. What's important to me is that we learn from our missteps so that the next time we offer an initiative, it's a more complete program. If you're looking for ways to continuously improve what you're offering to residents, check out our insights on a few programs below. For more on our process of goal setting and evaluating the programs we run, check out this blog. 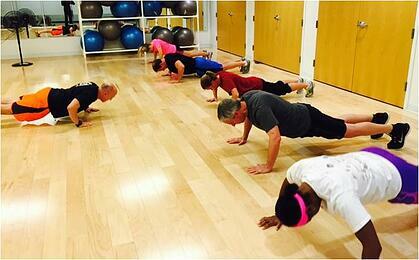 Last April, Tim hosted a membership campaign to attract residents who were not members of the fitness center to join. Goals for the initiative were simple, as was the overall structure of the program. The fitness program at this client community is well-established with about 67% of the eligible residents already members of the fitness center. They regularly gain about five to six new members each month, so the focus of this program was a targeted outreach to long-standing residents who had not yet joined the fitness center. Tim believed that if he could get them in the door for orientation by lowering the barriers to joining AND inspire them to attend at least one group fitness class during the month they joined, those new members might be more active/engaged in the long run. Tim set up "open orientations" for the month to create easier opportunities for non-members to attend. Despite issuing personal membership packet invitations to each of these residents, no one attended those orientation sessions, nor were any of the membership packets returned. While they did pick up five new members in the month, they all came from a pool of newer residents who had moved to the community recently. And of those five who joined, only one attended a class during April. Sending invitations by community mail to non-members didn't generate a response, so future membership programs need to enlist a different outreach approach at this community. It is worth noting that we had a strong positive response to this very approach at a different client community. So if you operate multiple venues, you may need to adjust your approach per location. Alyssa was able to achieve the total visits goal (1,705 visits in February 2018) and the membership goal (5 new members gained in February 2018). But she didn't reach the goal focused on frequent visitors (5+ or 8+ visits per month). She received positive survey feedback from participants. In reality, the program itself was strong. But the goal focused on increasing frequent fitness center visits was probably the wrong aim. 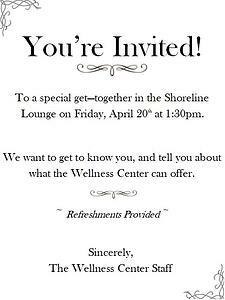 Future offerings like this that aren't specifically targeted to draw members into the fitness center will be created with different program goals in mind. 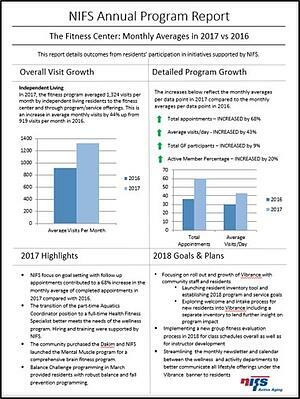 Want to find out more about how NIFS can provide this kind of smart, strategic programming to your residents? 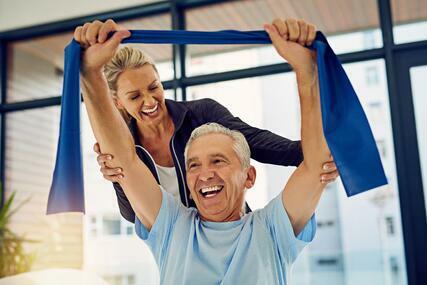 If you DIY the fitness program in your senior living community, you probably think your offerings are market-standard and don't need to be reconsidered. Even with strong staff running your fitness program, that in-house team has limits on what they can build for the community, and it's likely that you're missing out on opportunities for substantial improvement. The problem with those missed opportunities is that even with something as basic as exercise, it's tough to know what you don't know. Annual fitness center visits increased 44% despite there being no change in total eligible residents during this time. Appointment volume increased 68% which means that residents got a lot more high touch interaction with our fitness experts. The average number of fitness center visits per day increased 43% and the number of residents who visited the fitness center at least once per month jumped 20%. In a community where the group fitness program was already strong, we made a few tweaks and overall class participation increased 9%. Identify new ways to attract residents into appointments and structure documented follow-up practices to keep residents engaged in their exercise programs. Adopt a program evaluation framework that allowed them to focus in on a few goals and truly evaluate what was/wasn't working in their community. Provide comprehensive balance training/fall prevention programming with a depth that far exceed previous efforts, and served to draw in new participants to the fitness center and group fitness classes. If you're ready to start moving your community fitness program to the next level, click below to download our eBook: How to Transform Your Fitness Center From Vacant to Vibrant.